SAN ANTONIO, Texas – U.S. Representatives Charles Gonzalez and Ciro Rodriguez joined U.S. Treasurer Rosario Marin, Freddie Mac and the Hispanic Association of Colleges and Universities (HACU) today to launch a national consumer credit education initiative to help prepare the country’s fast-growing Hispanic communities for the financial responsibilities of higher education and homeownership. “The nation’s youngest and largest ethnic population also represents our fastest-growing consumer group. This important new consumer credit education curriculum, CreditSmart Español, is designed to provide our Hispanic communities the best information available about how to achieve life-long financial goals,” said United States Treasurer Rosario Marin. CreditSmart Español, a bilingual financial literacy curriculum from Freddie Mac, was introduced for the first time today at St. Mary’s University, where 68 percent of undergraduate students are Hispanic in a city with a predominantly Hispanic population. CreditSmart Español will be introduced later this year at HACU member colleges and universities in California, New York, Florida, and Puerto Rico. HACU represents more than 340 colleges and universities, which together serve the largest concentrations of Hispanic higher education students in the United States. The CreditSmart Español courses at St. Mary’s University and the other HACU institutions will be available to students, their families, and members of the local community. The free classes will teach consumer credit and money management skills, with an emphasis on preparing consumers for the financial responsibilities of homeownership, paying for college, and achieving other financial goals. Freddie Mac was led to expand its trademarked CreditSmart program for U.S. consumers to CreditSmart Español because historically, Hispanics have low homeownership rates. According to the U.S. Census Bureau, while 68 percent of the nation’s families own homes, less than 48 percent of Hispanic families are homeowners. CreditSmart Español is a component of Catch the Dream, Freddie Mac’s comprehensive plan to help achieve the Bush Administration’s goal of adding 5.5 million minority homeowners by the end of the decade. “As the nation’s leading voice for Hispanic higher education, HACU is delighted to join in this ambitious new initiative to offer financial skills to our Hispanic students and their families. Thanks to the foresight and leadership of Freddie Mac, our students have access to valuable information that can lead to a more financially secure future,” said HACU President and CEO Antonio Flores. HACU and Freddie Mac later this year will introduce CreditSmart Español at Miami-Dade Community College’s Inter American Campus in Florida, at the University of the Sacred Heart in Puerto Rico, at Hostos Community College of the City University of New York and at California State University at Fullerton. Today’s announcement is part of a larger, nationwide launch of CreditSmart Español announced on December 10, 2002 with the Cuban American National Council, League of United Latin American Citizens, National Association of Hispanic Real Estate Professionals, National Council of La Raza, National Puerto Rican Coalition and the United States Hispanic Leadership Institute. Freddie Mac is a stockholder-owned corporation chartered by Congress to provide a continuous flow of funds to mortgage lenders to sustain a stable mortgage credit system, thereby reducing mortgage rates paid by U.S homebuyers. Since its inception in 1970, Freddie Mac has opened doors for one in six homebuyers and 2 million renters across America. For more information, visit www.freddiemac.com. HACU, a non-profit, tax-exempt 501(c) (3) organization, is a national leader in Hispanic education initiatives, including pre-collegiate outreach, Hispanic higher education advocacy, international partnerships, lifelong learning and workforce development initiatives, scholarship and internship programs, and innovative education technology projects. 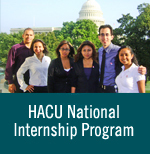 For more information, visit www.hacu.net.